Thermo-regulated fermentation between 24°C and 29°C takes 7 to 9 days. Maceration on the skins for 5-9 days. The wine matures in barrels and casks for 18 months. 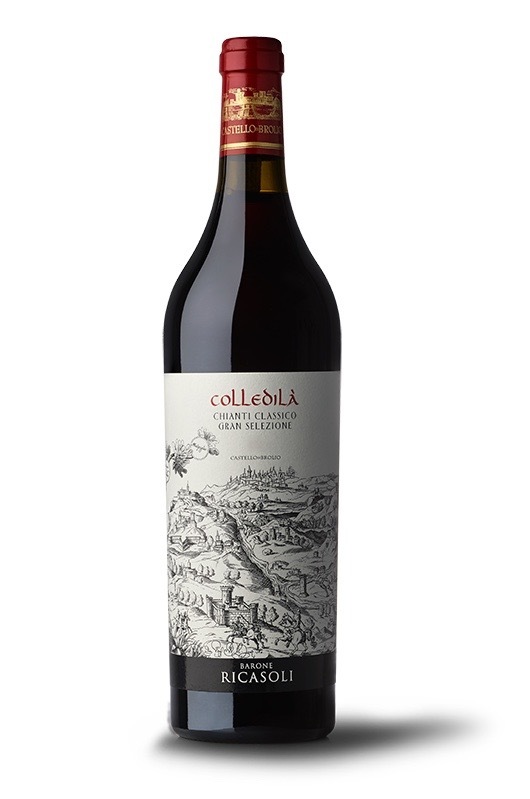 “Colledilà” – the land which has been part of the Brolio estate for centuries – is the cru of this Chianti Classico DOCG that stands out due to its complex structure and great modern elegance. The research on original clones that has been carried out at Barone Ricasoli for the last fifteen years and the work on the specific characteristics of the various plots of land on the estate have now given rise to a single varietal Sangiovese which manifests the magnificent gifts of this grape variety. The limited volumes of the Colledilà cru render it all the more exclusive. The vineyard is located at an elevation of 380 m and faces south-west, in the most beautiful and representative part of the estate. The land is Paleocene-Eocene in origin and forms part of the geological formation ‘Monte Morello’. The soil is brown with a fine clay structure, very chalky, with a sub alkaline pH and little organic content. It is well drained, very stony and has an average water-holding capacity. The 2009-2010 vintage was fairly unusual, with a cold, snowy winter, rainy spring, hot summer, and variable weather in September and October. Thanks to the snowfall and rains there was no risk of drought, and the vines worked steadily and well. The considerable day-night temperature excursions at the end of August and the beginning of September allowed the grapes to have the right sugar concentration, good acidity and color extraction. The Sangiovese was harvested at the beginning of October, and the grapes from the various vineyards were fermented separately. The chemical analyses of the musts carried out during fermentation gave uncommon results: High acidities, low PH, very high potential alcohol levels, and high, excellent polyphenol and coloring substance profiles. “This is the best Sangiovese we have ever seen. Incredibly intense, charged hues, and extraordinary concentration”. Pure and fresh, sporting black cherry, black currant and floral aromas and flavors. The tannins cut a dense swath, yet remain integrated. A touch of oak spice appears on the aftertaste. Fine length. Drink now through 2018.—B.S.Wine Spectator.